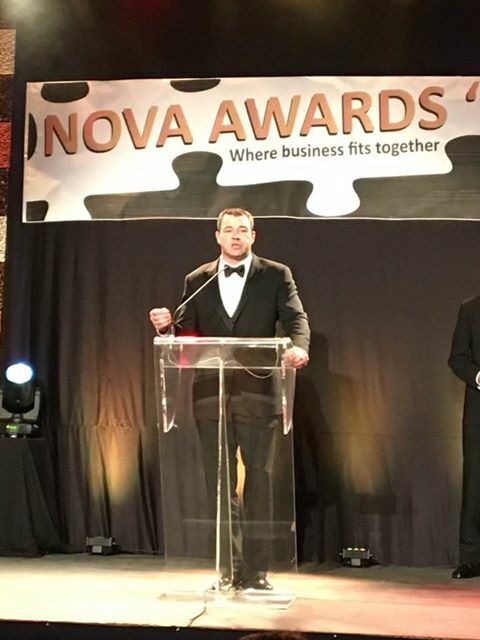 2017 President’s Award Winners | The Bucket Shop Inc.
TIMMINS – Paul Woodward took home the President’s Award at Thursday night’s NOVA awards. “There really are no words that can describe how proud we are as a family. I could almost cry,” said Woodward, owner of The Bucket Shop. “It’s all about our team and our people, and we couldn’t have done it without them,” he said. Woodward is optimistic about the city’s economy. Woodward said embracing change and staying positive are essential. His business will undergo some change in the coming months as it moves into a 65,000 square foot facility. Woodward was among 16 winners at the Timmins Chamber of Commerce NOVA Awards, held in the McIntyre Community Complex on Thursday evening. Host Art Pultz noted that 17 of the finalists were young professionals. “We have sold this event out. There’s over 700 of you here, making this the largest business awards celebration in Northern Ontario,” Pultz told the crowd. Mascioli Construction won the OPG Lifetime Business Achievement Award, leaving owner Phil Mascioli stunned. “We’ve gone from building all the roads in Timmins, and sewer and water, and now we’re into brick sales and landscaping products,” he said. As for what lies ahead? The two-year-old Timmins Festivals and Events Committee won the City of Timmins Non-Profit Organization Award. Chair John Olaveson said he was humbled. CreeQuest took home the De Beers Canada Indigenous Partnership Award. The Cochrane-based company provides hospitality services to Northern Ontario’s remote camps. Gagnon said she will be traveling to New Brunswick soon, as part of plans to grow the company across the country. Katelyn Malo of Black Spruce Gallery and Framing won the Collège Boréal Young Professional Award. “I’m so proud to have a business in this wonderful community,” Malo said.